The Carlisle PK 1880 Burners are an all stainless steel construction. The standard PK Burner and the 1880 Series tube assemblies differ in that the 1880 Burner Series face has individual oxygen porting surrounding the gas porting. This allows for a more defined flame. The tube assembly of the 1880 Burner Series is not angled inward like the standard PK Burners. The 1880 Burner Series can be used with natural gas, propane, or hydrogen and oxygen. The PK 1880 Burner Series has an almost infinite possibility of flame characteristics. Although, it should be noted that when using a low soft flame, oxidizing effects should be maintained. Reducing or normalizing fires in the low flow range will cause premature burn-out of the stainless steel face. 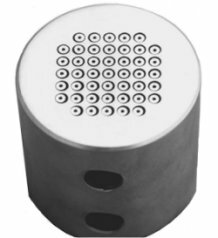 The housing of this Burner Series has a cylindrical shape rather than the square shape of the standard PK Burner. The housing has two inlet feed ports which are sized 1/8" FPT. Both the fuel gas inlet and the oxygen inlet are located on the side of the burner. As always, Carlisle is willing to work on any special designs that would suit your particular needs. The PK 1880 Burner Series could be manufactured in a hand torch model or even with a water cooling option. If these or other new concepts are what you are looking for, please contact the Carlisle sales staff directly.